I would love to have a microscope to examine fiber at a much closer level. For now camera magnification will have to do the trick. 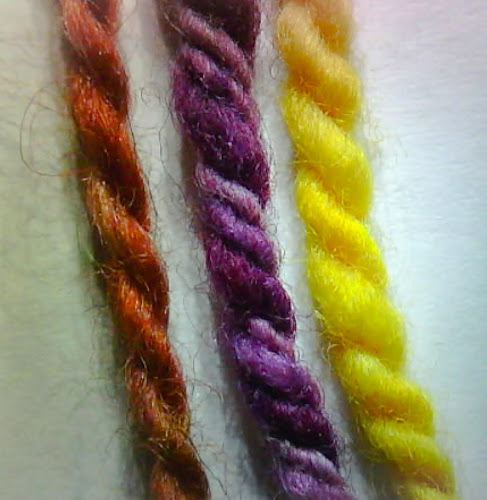 In the photo below are three hand spun fibers. The orange is a 2 ply BFL and silk blend. The purple is a 3 ply merino. The yellow is a 2 ply polwarth. I find it interesting that the two ply polwarth and the 3 ply merino look so similar. I wonder if it is related to the bouncy springy characteristics of polwarth. Another important thig to remember is that polwarth were developed by combining 1/4 Lincoln and 3/4 Merino.. So the similarity to merino makes a lot of sense.